Norse mythology is one of those things, like dragons and vampires, that possesses an enduring mythology. Regardless of the setting, its themes and figures always seem to fit in with an effortless cool. Fimbulwinter, for those not in the know, is a mythical season that heralds the end of the world in Viking mythology, whereby the land suffers three full seasons of ice and snow. There are giants and, of course, conflict, and the whole legend is incredibly bawdy and exciting, in the way that Norse mythology can be and other world legends struggle to manage. Beginning with a family feud, a murder and a resurrection all in the first fifteen minutes, Fimbul gets right to the point. Newly revived by the plot, legendary yet ageing berserker Kveldevur embarks upon an epic quest not to find all his missing vowels, but to slay his brother in revenge for the murder of their father and, well, Kveldevur himself. 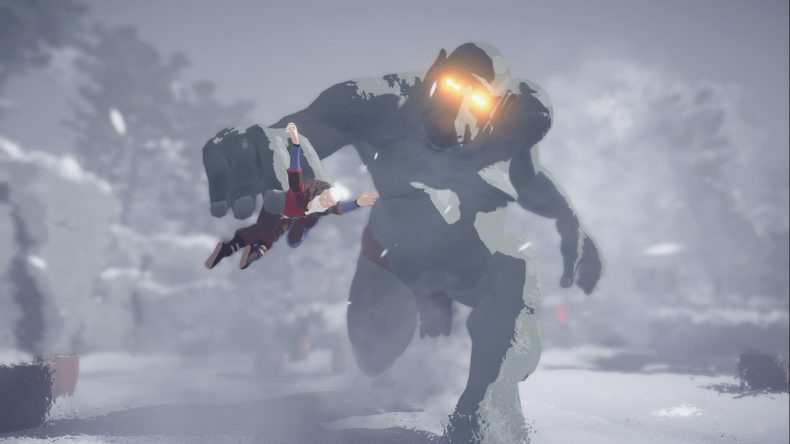 Aside the inclusion of Giants, or Jotunn, Fimbul actually does a pretty good job of telling its own tale without leaning too heavily on existing mythology. The fate of the world is at stake as Ragnarok looms, and Kveldevur’s quest to prevent it takes him across the steppes, tundras, frozen lakes and snow-draped forests of ancient Scandinavia. Along the way, he opts to keep his temperature up and his blood flowing by slaughtering countless enemies, both human and Giant. More fantastical elements such as trolls do creep into the action, but overall the plot stays mostly grounded. Sadly, this means it also fails to ever really do anything extraordinary. 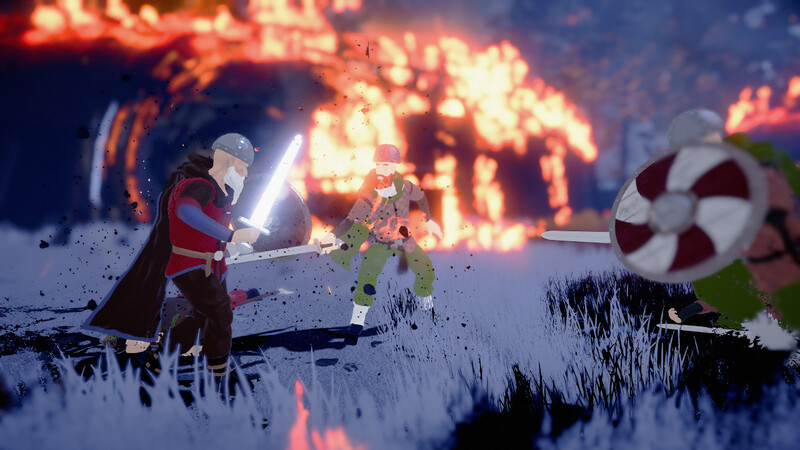 Fimbul is an aesthetically pretty game, using a retro artstyle to bring Kveldevur’s martial lethality to life against a backdrop mostly hewn from fresh white snow, fallen trees and unwelcoming crags. 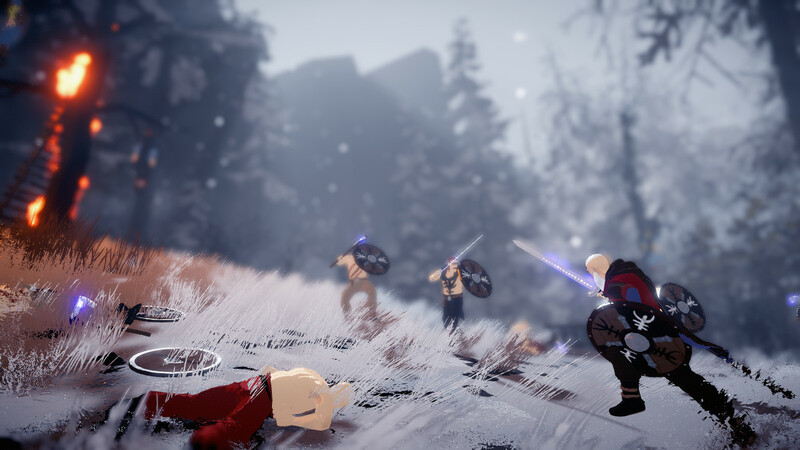 Unsurprisingly, the shock of bright red blood against pristine snow is a regular sight, and if nothing else Fimbul’s combat is a fairly rythmic exercise. It’s quite bare bones, eschewing any progression or skill trees, and so it doesn’t evolve at all from start to finish. Unfortunately that makes it feel stale very quickly, and once you start to feel the tedium it doesn’t ever pick up again. Defaulting to just his longsword, Kveldevur can pick up the weapons of his enemies to expand his arsenal. He can carry an ace in his belt and a shield which is all too easily shattered, or can strap a spear to his back and carry a second in his hand which he can either throw or engage the enemy with. Combat is bloody and brutal, though buggy and occasionally laggy, and makes up the bulk of Fimbul’s runtime. Switching weapons on the fly is key to survival, but fairly simple to get to grips with. You can also slap on a dropped helmet for a moderate boost to your overall defence. Kveldevur also has a handful of special abilities he can call upon, such as a magical banner that heals him for several seconds and a powerful shoulder charge that will break through an enemy’s defences. A subplot that sees you guiding a young boy through a Jotun prison serves as a nice way to break up the tension in the early part of the game, introducing a rudimentary stealth section, which is a little unforgiving, but proves to be a nice change of pace. Aside this, the story never really fully gets going, although this might be down to the comic-style cutscenes that didn’t do an awful lot to grip me. They’re well drawn, though, and the writing is decent throughout. Fimbul is a fun little game that needed a lot more fleshing out. The combat is okay, even satisfyingly brutal for an hour or so, but it gets samey very quickly and never really changes pace. Even with bosses, it’s simply a case of dodging attacks and waiting for an opening. You’ll never really modify your tactics much, other than to aim for blatant weak spots. But it is a pretty game, with a wonderfully evocative art style that pushes the atmosphere front and centre. 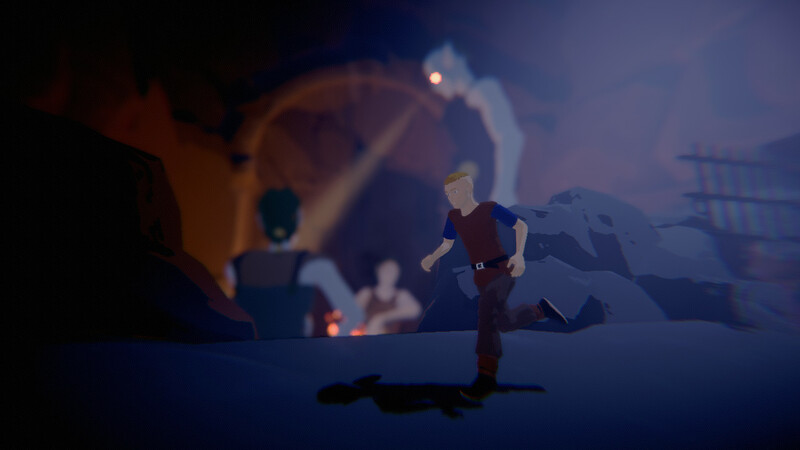 The icy winds, the unforgiving cold, the darkness of the forest and the sultry lick of flames slowly and deliberately devouring the world are just enough to keep you invested in Fimbul’s tale. It’s just a shame there isn’t more of it, or at least more variety to what is here.